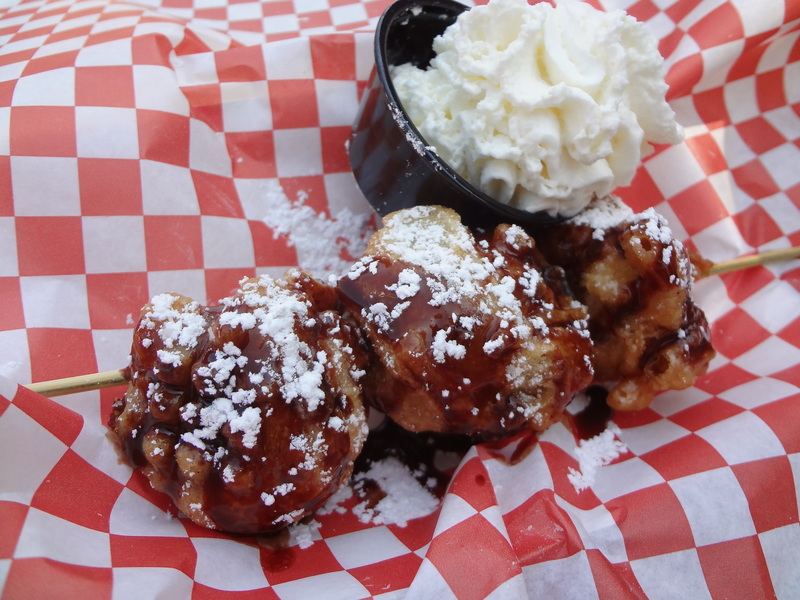 A new food, and a new vendor, at the fair this year is poutine from Duke’s Poutine. 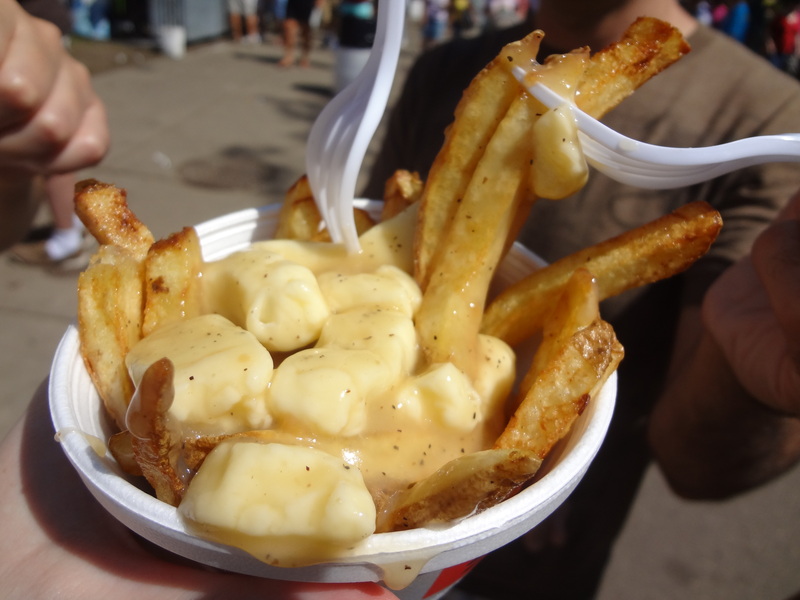 I hadn’t tried poutine before my trip to the fair, but this Canadian specialty of fries smothered in gravy and topped with cheese curds was definitely on my eat list. And for good reason! The fries were nothing extraordinary, but when topped with peppery gravy and teeth-squeeking cheese curds, they become a nice little raft for transporting your mouth to the land of happy. I was pleasantly surprised by this dish, I thought it could end up being too salty for my taste, but the flavors were more subtle, very nice overtones from the gravy with the cheese curds making an appearance at the end. My one issue this is the dish is the size of the portion compared to the price. $5 for a tiny dish of poutine seems a bit steep. Definitely worth a try if you’re curious, but if you’re on a State Fair food budget, I’d pass it by for others on this list. You must make a stop at Custard’s Last Stand. 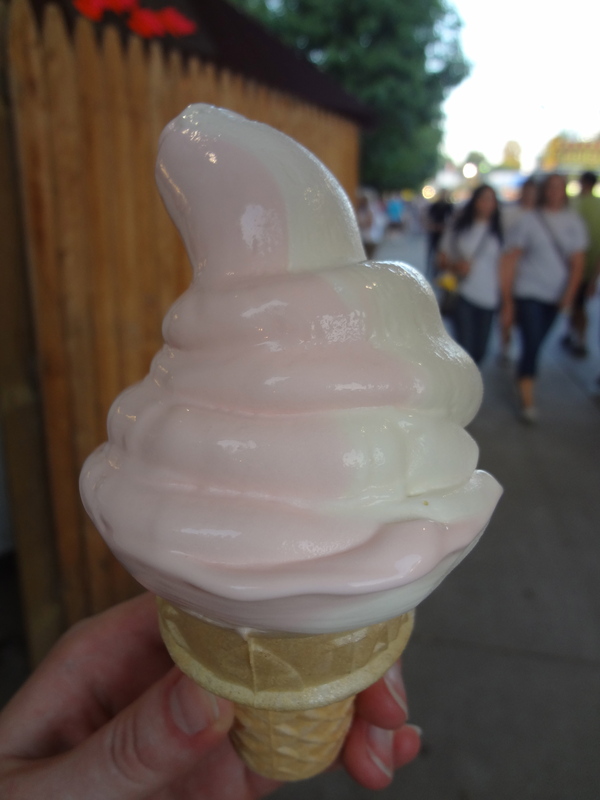 If you eat one dairy product at the fair this year (and there’s really no way to avoid that), go to Custard’s Last Stand and try their frozen custard. By far the best frozen custard I have ever tried, Custard’s Last Stand offers a simple variety of flavors on a cone, in a dish, and frozen on a stick with a few add-ins. Pictured here is my new favorite flavor combo – vanilla and strawberry twist. This is the smallest sized cone, and at only $3 is a great bargain for the quantity and quality of custard you get. It has an amazing thick and creamy texture without being too rich to finish. It melts fast, but chances are you won’t let it stick around long enough to dribble on your shirt. I’m being a bit of a tease here since you can no longer get these cranberry wontons, but if they make an appearance next year, it’s worth a stop. Tucked away in the International Bazaar is Midtown Global Market’s food stand, with a rotating array of vendors, like Pham’s Deli, making appearances during the fair. Pham’s Deli exited on Sunday, with Sonora Grill stepping in until the 30th, and I was very glad I caught these wontons before they disappeared! Shaped like monster-sized cream cheese puffs, these wontons boast a crispy outside that works wonderfully with the cranberry-infused cream cheese inside. 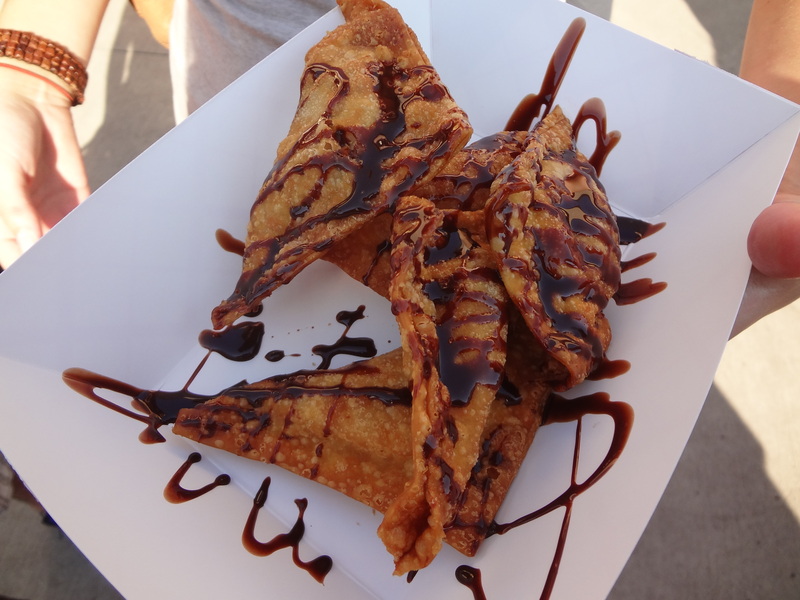 The chocolate sauce drizzle is optional, and really depends on your taste preferences, but I thought the little hint of chocolate complimented the tangy/sweet flavor profile of the wontons. And with 5 per serving, there’s plenty to share! By now, at the fair, if you’re not thirsty, you’re doing it wrong. So go quench your thirst with some root beer from the Draft 1919 stand. By far the best root beer at the fair. And I don’t even like root beer, so you know I have high standards. This root beer is a great combo of sweet and spicy, and you get a large glass for only $1.25. 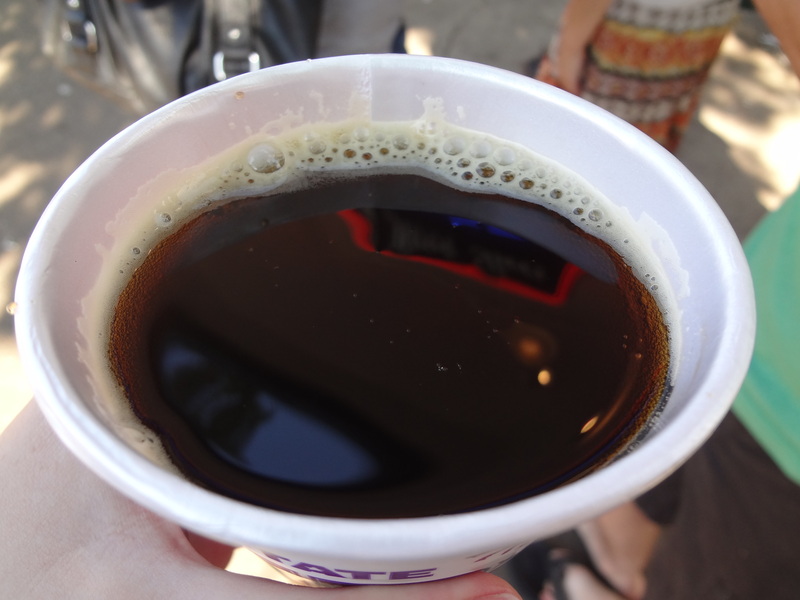 While I don’t normally drink pop (soda, whatever), I make an exception at the fair and indulge in some root beer. It could be the American brought out in me by the abundance of deep fryers, mullets, and beer bellies, but having this root beer at the fair is definitely a highlight. 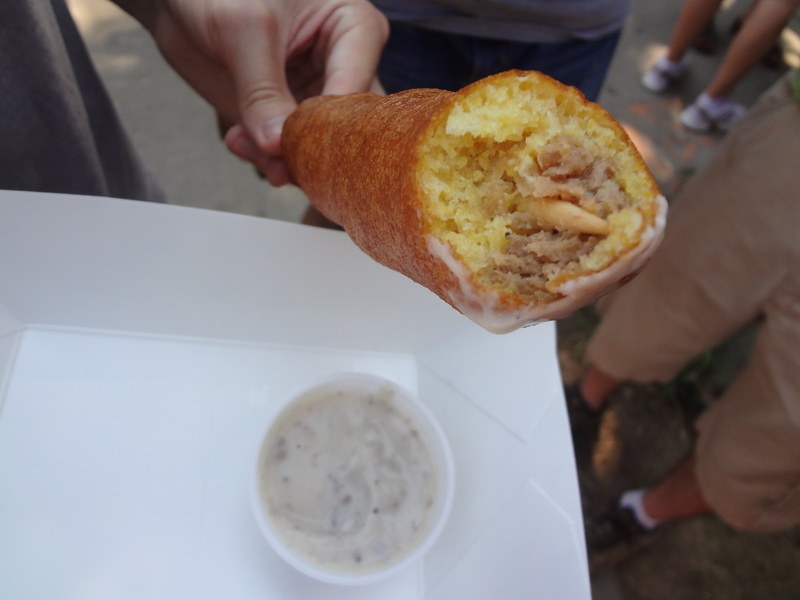 One of the more creative foods I tried at the fair, this tater tot hot dish on a stick was always a bit intimidating. I was curious, but would it be too much for me to handle? Nope. Not at all. In fact, I would eat this again! Layers of meatballs and tater tots dipped in corn dog batter, fried, and served with a cream of mushroom dipping sauce doesn’t sound appealing to everyone, I totally get that. But give it a shot. I was really surprised by the warm, homey flavors this hot dish brought through. The corn dog batter wasn’t overwhelming, like I thought it would be, and the creamy-ness of the mushroom dipping sauce was great with the flavorful meatballs. If you’re looking for a slice of Minnesotan adventure, this would be the way to go! Oh Giggles, is there nothing you can’t do? You wowed me with your North Woods salad last year, and now you present another amazing addition to the fair. The Walleye Roll. Like a chicken salad of Walleye, this fish swims with minced celery and Minnesotan wild rice, all atop a bed of shredded iceberg lettuce (adds a great crunch! ), and nestled in a toasted brioche bun. Yes, that’s right people. I said brioche. At the State Fair. We Minnesotans are so fancy. This was an amazingly light, non-fishy tasting, fish dish. A great option if you’re looking for something to keep you full and not leave you feeling greasy. 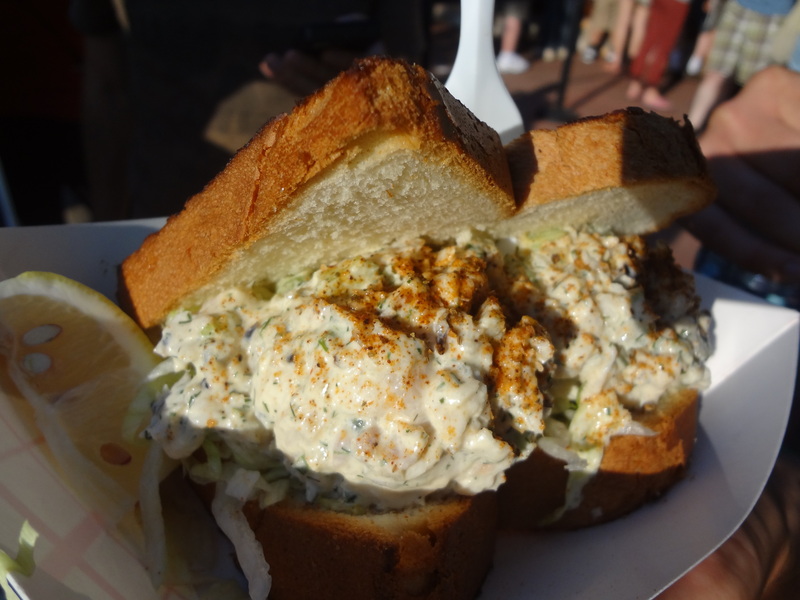 I love that Giggles is bringing a fresh and healthy (well…healthier anyway) spin to traditional fair food. If you’re going to create something new, don’t go the way of the corn dog pizza (yes, a that’s real thing), step it up a notch on the culinary food chain and bring fresh Walleye and brioche to the table. Well done, Giggles! Now you’ve got a peek at my new favs, but don’t you want to discover some treats for yourself? Here’s a few tips I use to maximize time, and tummy space, while at the fair. 1. If you’re planning a foodie excursion to the fair, do some research first. Find out what you want to try, where it is, and jot it down. 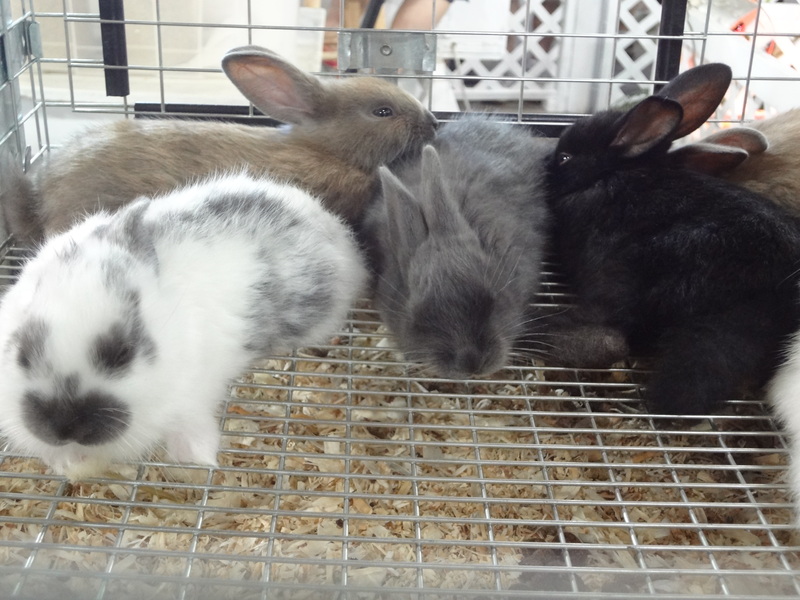 Once you’re there, it can be pretty overwhelming to find what you’re looking for, especially if you don’t know the fair that well, or are easily side tracked by the adorable bunnies in the Miracle of Life barn. 2. Go in a big group! How am I able to sample so many things on a trip to the fair? It’s not because I have a magically expandable stomach (Or is it? ), but because I go in a large group with the mutual understanding we will all share a bite of what we buy. A tub of cheese curds will fill you up fast, but sharing between 4 or 5 people leaves you ready to try something else. This entry was posted in Uncategorized and tagged Brioche, Chocolate, Cranberry, Deep Fried, Event review, Fries, Frozen Custard, Hot Dish, Minnesota, Minnesota State Fair, On a Stick, Poutine, Root Beer, State fairs, Sweet Potatoes, Tater Tots, Walleye, Wontons by theculinarycapers. Bookmark the permalink.